Uber is proceeding with its self-driving car program after a brief suspension in three states in response to one of its vehicles being in a high-impact crash and flipping on its side. 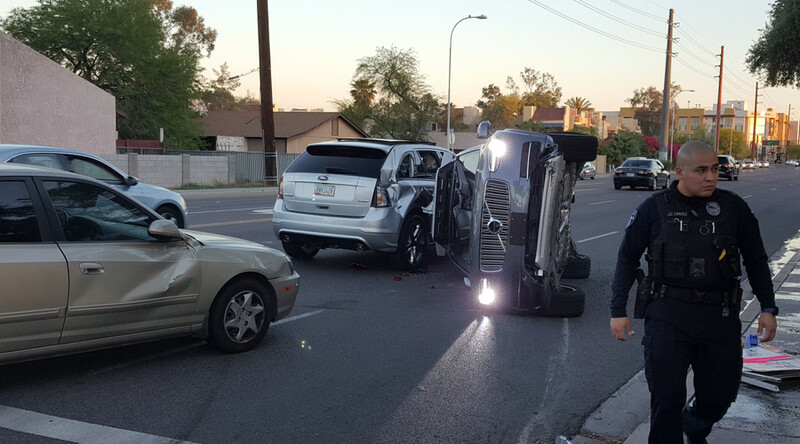 The Volvo SUV was making a left turn at an intersection in Arizona, where Uber has been trialing autonomous vehicles, on Friday when another car “failed to yield” and struck it, according to police. “There was a person behind the wheel [of the self-driving car]. It is uncertain at this time if they were controlling the vehicle at the time of the collision,” said officer Josie Montenegro. A picture of the badly damaged vehicle was posted online and verified by an Uber spokeswoman who confirmed the incident to Bloomberg. There were two operators sitting in the front of the Uber vehicle at the time of the collision, but no passengers, and no injuries were reported. Uber said they would investigate the incident. Over the weekend, they pulled their self-driving vehicles off the road in all three states where they are testing the technology – Arizona, Pennsylvania, and California – as a precaution. Uber confirmed its autonomous automobiles were back on the road in Pittsburgh, San Francisco and Tempe on Monday, Reuters reported. The accident rounds out a tumultuous week for the company. On Monday, former Uber President Jeff Jones cited irreparable differences as the reason behind his shock decision to leave the role after only six months. “The beliefs and approach to leadership that have guided my career are inconsistent with what I saw and experienced at Uber, and I can no longer continue as president of the ride sharing business,” Jones said in a statement released on Monday.